The Dennis family has been recorded in the beautiful Land’s End to Penzance region of Cornwall for nearly 450 years. It can be tracked with some confidence from the time when three brothers named Sampson, Richard and George Dennis turned up in Saint Buryan parish records just after the 1664 Hearth Tax return. This book follows the fortunes of George Dennis and his descendants through several centuries of their lives in Cornwall, as times grew progressively tougher. Appendices refer to other parts of the family. In 1822 was born George Dennis, a g-g-g-grandson of the original George. Ten children were born before George Dennis died in 1866, leaving his young family to struggle through harsh economic times. In 1874 his widow Susan Dennis, her five sons and two surviving daughters arrived in Sydney Harbour. They came as assisted migrants on two different ships, ready to start a new and better life in Australia. They joined Susan’s other daughter Jane and her miner husband William Williams, who left Cornwall in 1866. Living first at mining settlements at Currawang near Goulburn, and Cow Flat near Bathurst, the Dennis family eventually settled in various parts of New South Wales. Within thirty years of arriving in Australia as a thirteen-year-old labourer, Susan’s son James Dennis was a Master of Arts from Sydney University and then Inspector of Schools for NSW. His two sons Spenser and Cleon were amongst Australia’s first lifesavers, at Bondi Beach. Spenser became a designing engineer for the Sydney Harbour Bridge and Cleon became Engineer Lieutenant in the Royal Australian Navy. 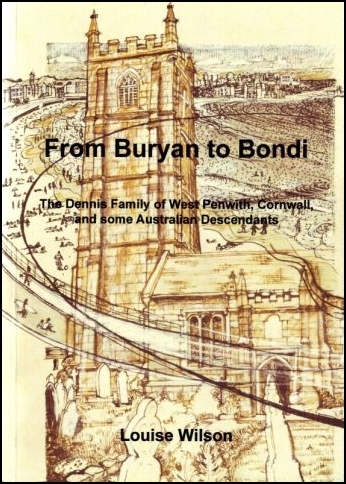 Review : "From Buryan to Bondi". is a meticulously detailed account of the Dennis family history. The book provides fascinating and invaluable insights; both personal and historically accurate information, and perhaps more crucially provides a link to our roots which explain for me the influences at work in all families,even today.